I'm posting this one for Yvonne in particular! We were talking about using antique mohair last week and I mentioned I was working on an antique mohair and modern mohair combination ... well, 20" Cornelius is the result! He'll be coming to Hugglets with me on September 14th. Oh...Thank you Paula!! What can I say...Wow! !.....Cornelius is simply stunning..you have worked the fabrics together so perfectly! Fabulous work! 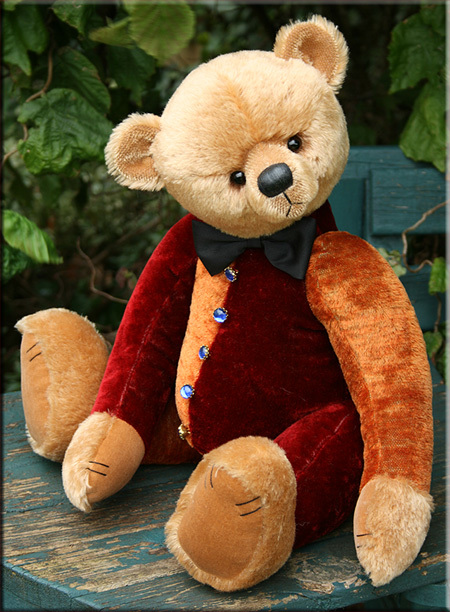 I absolutely love everything about him :[img]http://ww ...the colour combinations are gorgeous...and do you know judging by the the expression on his face....I think he knows.. he's a very special bear too!!! Can't wait to see him in the fur at Hugglets! He's gorgeous Paula, it's worked really well mixing the two, you made a good choice of modern mohair to go with the old. Yvonne, Pauline, I'm so pleased you like him! Fingers crossed he has a good show!!!! !